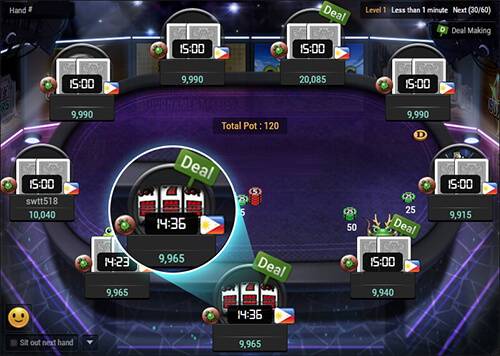 TOURNAMENT FINAL TABLES LIKE YOU’VE NEVER EXPERIENCED BEFORE! What unique features do final tables at tournaments offer? Switch Seats – A new exciting twist that will allow you to switch seats! 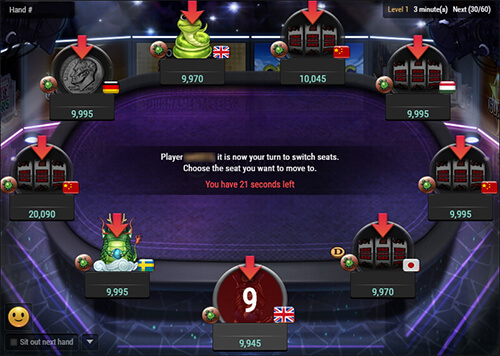 When do these final table features activate? How does switching seats work? 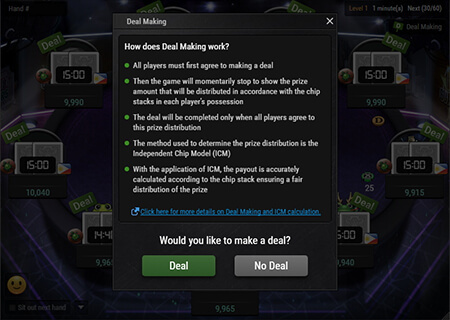 How does Deal Making work? 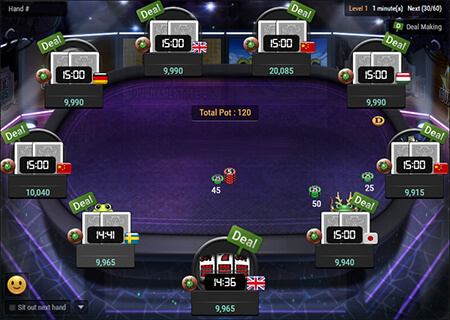 In the top right corner of the final table, there is a Deal button (PC: Deal Making button). Click it to bring up the agreement pop-up. You will be able to agree to Deal Making from here. If you wish to cancel, then click the button again and select ‘Cancel Deal Reservation’. What is ICM (Independent Chip Model)? ICM is an acronym for Independent Chip Model, and is a distribution method based on the current chip count of players regardless of external factors such as poker skills, blinds, bubble, and etc. How is it different from the Chip Chop method? There are situations when the chip leader receives more than the first place prize amount when a Chip Chop method is applied. In these cases, other players will also receive prize amounts less than the expected prize payout. Therefore, many cases may arise where players will not agree to Deal Making. Unlike the Chip Chop method, the ICM method takes more factors into consideration and ensures a more fair distribution of the prize. How to calculate payout via ICM? The chip count is not considered real money before the tournament is completed. For the sake of example, let’s say the first and second place prize amount is 100 and 50 respectively but the status of chips is 1,000 and 1 respectively. In this situation, even though a player may have 1,000 times more chips, the player will only be awarded a prize amount that is two times greater. Therefore, distributing the prize based solely on the chip count is unreasonable. Using ICM in the example above, the prize will be distributed 99.95 and 50.05 respectively. When using ICM to calculate the prize payout, there is a specific amount of chips based on N players, and when players randomly go all-in (each all-in winning rate is 50:50), the odds of each player finishing from 1st to Nth place is determined to come up with EV. What is a Game Clock?